Don’t make like a banana and…you know. Stick around for today’s food facts. 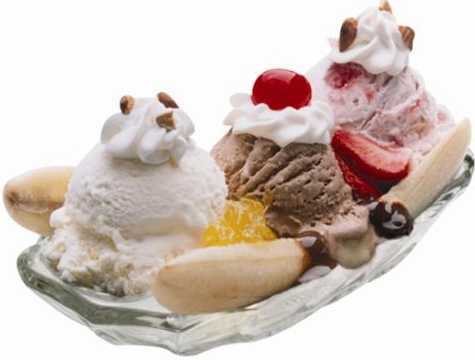 The banana split was invented in 1904 at Strickler’s Drug Store in Pennsylvania. A banana split is an ice cream-based dessert. In its classic form it is served in a long dish called a boat. A banana is cut in half lengthwise (hence the split) and laid in the dish. There are many variations, but the classic banana split is made with scoops of vanilla, chocolate and strawberry ice cream served in a row between the split banana. 1840 Joseph Gibbons received a patent for a seeding machine. 1910 Arnold Neustadter was born. Inventor of the Rolodex rotating card file. 1935 Curtis Fletcher Marbut died. American geologist and one of the founders of modern soil science. He was with the U.S. Bureau of Soils for 25 years. 2001 In Oslo, Crown Prince Haakon of Norway married former waitress Mette-Marit.